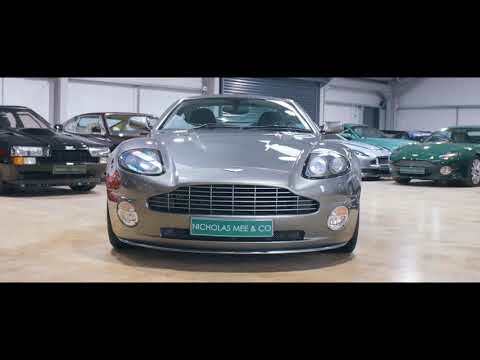 The original Aston Martin V12 Vanquish S, built at the Newport Pagnell Works between 2004 and 2007 is now firmly establishing its ‘future classic’ status, with many observers suggesting that the now iconic styling of the Vanquish being the high point in styling of ‘New Era’ Aston Martins. With just 1,086 Vanquish S produced in total, the model remains one the more limited in production of the recent era. The superb example we are now delighted to offer was originally supplied in February of 2007, just over 150 cars before the end of the production run and is finished in the distinguished colour combination of Mercury Silver with Phantom Grey hides. In addition to the usual Vanquish S refinements, optional extras specified on this example include Bluetooth, grey brake calipers, console storage box, body colour door releases, front stoneguards, heated front screen and 2+2 seating arrangement. Previously supplied by ourselves to its 2nd owner in 2011, this car benefits from an excellent service and maintenance record by either or own workshops or Aston Martin main agents and is in fabulous condition throughout, testament to its cherished, enthusiast ownership. Prior to delivery to its new owner, a fresh service and preparation will be carried out with 12 months MOT and warranty.